As I mentioned previously in my post Perfect Blues for a Beach House, we had a customer that sent in some fabric for chairs to place in a beach house. We liked the colors so much that we decided to find something similar to offer our customers. It was a shame that we didn't get some pictures before her chairs shipped out, because not only did she have great taste in fabric, but also put together a chair design that was stunning. 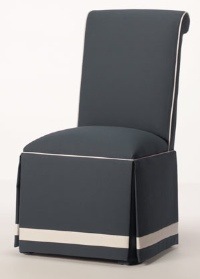 After we added the fabrics to our line, we decide to go all the way and add a new chair to match. The Nantucket Parsons Chair is a combination of several styles that we've offered for a while. It has a scrolled back and a banded, kick-pleat skirt. You have the choice of using a contrasting fabric for the border which runs around the seat and the back. While this chair was envisioned for a beach home--you can select from hundreds of fabrics that will allow you to add it to almost any environment.This chair is also a perfect example of the flexibility that you have. We welcome customer suggestions and requests for new styles and we're able to tweak most anything we offer. Our most common changes are to the height of the seat or back, changing the back style or leg type. However, we often get pictures or diagrams from customers that we can turn into entirely new styles. While we cannot accommodate every request, especially if it involves creating an entirely new frame, we will gladly look into getting you exactly what you want. There's a lot to be said about this, so I'll be talking about customization more in depth in a future post.